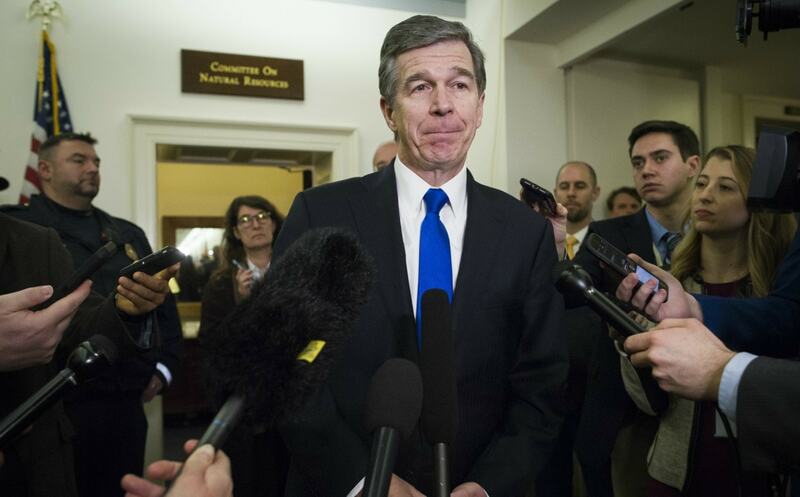 North Carolina governor Roy Cooper’s college yearbook has emerged with shocking images of frat boys in blackface, The Daily Mail reports. While Cooper is not seen in the pictures, this latest blackface controversy comes on the heels of politicians and others calling for the resignation of Virginia Governor Ralph Northam after his 1984 medical school yearbook showed pics of a man in blackface and another in a Ku Klux Klan robe – one of them purported to be Northam, although he now denies it. On Wednesday, it was revealed that Cooper’s University of North Carolina Chapel Hill 1979 yearbook also reportedly showed two members of the school’s Chi Phi fraternity wearing white KKK robes while acting out a lynching. There is a man wearing blackface while a noose hangs down from a chandelier which is tethered to his neck. Another insensitive photo shows a woman kissing a man’s cheek and both have their faces painted Black while she wears a “Mammy”-style headscarf. Cooper is in the yearbook but not pictured in any controversial pictures. He has not responded to the news about the yearbook, but did comment via Twitter about Northam last Friday. UNC Chapel Hill spokesman, Joel Curran, told the DailyMail.com in a statement: “The photos found in the 1979 student yearbook are abhorrent. This comes just days after three of Virginia’s top state officials came under fire with deepening scandals involving blackface and a sexual assault allegation. Virginia’s Attorney General Mark R. Herring made a bombshell admission that he also appeared in Black face in 1980, when he and friends went to a party dressed like rapper Kurtis Blow. Herring apologized but is resigning, something he called on Northam to do. All of this has surfaced as a woman accusing Virginia Lt. Gov. Justin Fairfax of sexual assault has come forward. In his own defense, Fairfax acknowledges a sexual encounter with Tyson at the convention, but maintains that it was consensual.